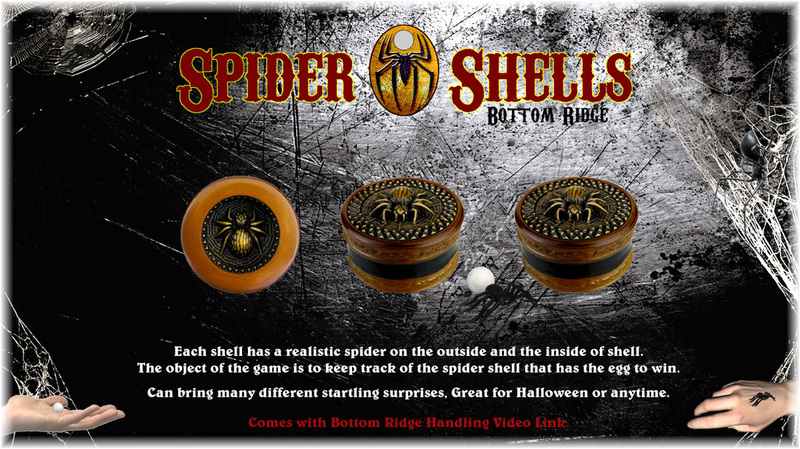 The Bottom Ridge Spider Shells are one of the most advanced shells in the history of the three shell game and done without any gimmicks. The bottom ridge is not a gimmick. It is just the opposite, as the ridge never hides the ball or holds the ball in the shell when the shell is lifted up off the surface. The ridge just gives the ball a path to continue its travel inside the shell when shuffled around on the surface. The standard type shells on the market only have one path of travel and that is a dead end in all directions. Everything can even be fully examined if need be. No need to switch the softball out. The softball has a reason for being soft, so they don't hear which shell the ball is in, by the sound. Unlike other shells, the ridge keeps the ball in the shells when moved in all direction, to make it a fair game. This type shell will even fool the ones that know how the shell game is done. Because they will never know when you steal the ball and load another shell. Also, once another shell is loaded with a ball, this shell can be moved without the ball coming out. This cannot be done with other softball type shells. This bottom ridge shell was designed so it is not a predictable shell and you will be view as one with good sleight of hand skills. The shell has an entirely flat surface. 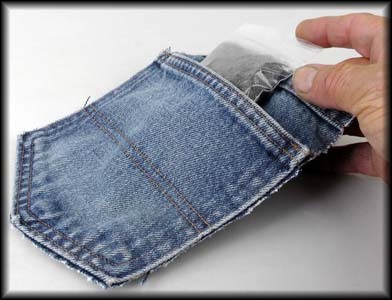 Gives you total freedom in doing steals and loads when you want to without any gimmick shell bottom. The shuffling of the shells can be extended without having to take the ball in the hand or have to keep reloading and stealing it on any movement of the shell. This will get the player to follow the correct shell that has the ball, by lifting the shells during the shell shuffle and showing what shell has the ball or the shells that don't have the ball. This not only gets them to follow the shell you want them to follow but cuts the stealing and loading of the ball down to one time. Not having to hide the ball in the hand and cuts out any chances of them seeing the ball in the hand. You have the choice to pick the right time to execute everything. The shell height and shape brings many features; the shell is shaped as a round cylinder and is 1" in height. This makes the shell easy to pick up off the surface. The inside has a lot of head space for the ball to roll freely at all times when rolling around inside the shell. The spacing inside the shell is so good that the shell has a realistic spider in the shell. Having the spider inside the shell gives a reason for the spider egg. Spider eggs; the egg is a soft 3/8" balls. You can even using larger 7/16" type balls that can be taken out of the shell very smoothly, without any notch or gimmick dip to the shell. The ball can work on a hard or soft flat surface. 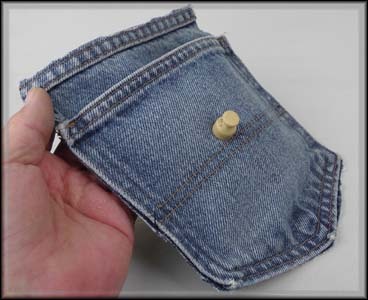 You will find they are easy to finger clip and back finger clip. 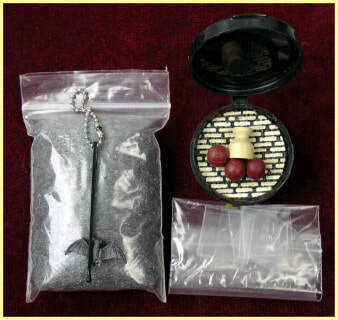 Weight is 10 grams per shell This is a high-quality professional shell set! 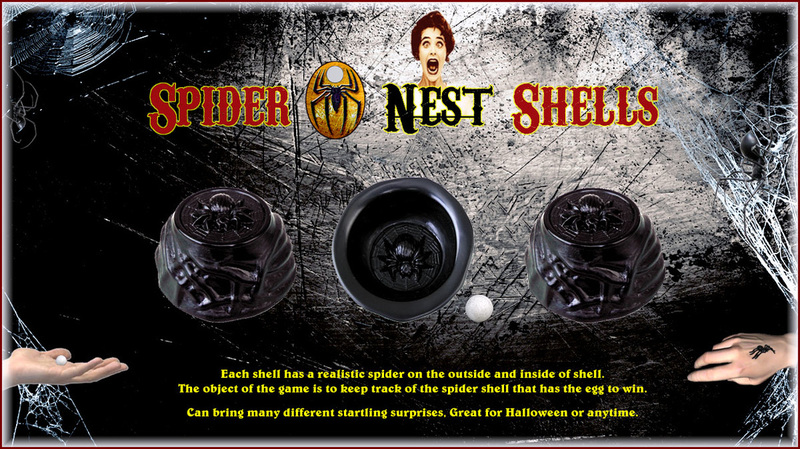 This accessory package has all the tools to bring some amazing and startling surprises for your shell game routine. M-Snatcher; I believe a magnet should never be overused in the shell game. I normally will only use a magnet once in a routine where it is bought in and out of the game so there is nothing to track back to. If you do something that looks impossible, you don't want to leave anything they can backtrack too. so they won't figure out how you did it. The M- Snatcher has an n52 grade magnet. This is the strongest grade magnet that is commercially made. The magnet is embedded in a high impact plastic housing so there is no direct impact on the magnet to break if dropped. Like anything, there is always a chance something can break, but the chances of that happening with this type of protected design are very low. Very easy in showing your hands empty when it is clipped in your hand. It is a breeze to bring in and out. empty at the same time. 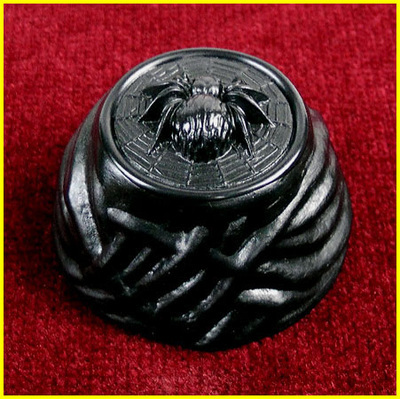 The off-white spider eggs; the egg is a soft 3/8" ball with very fine metal blended all the way through the rubber ball. This brings the feature of being able to work with a magnet and appears to be just a normal rubber ball. You never need to switch them out of the game. These balls are also the most advanced working balls in the history of the shell game. Even when using a larger ball they can be taken out of the shell very smoothly, without any notch or gimmick dip to the shell. The M-Snatcher can be used for hands-on startling effects, like where the egg is placed on the spectator's hand and a shell is placed over the egg. The M-Snatcher will steal the ball as the shell is placed onto the hand. The other two shells are shown empty. When the spectator lifts the shell up off their hand, the egg is gone. When the spectator turns their hand back over to pick-up another shell, they will be startled by finding a baby spider on the back of the hand that hatched from the egg. This ending surprise is much like "Jim Pace's -" The Web". Just done differently. The setup I like to use to bring the M-Snatcher in and out of the game; the enclosed pad of steel wool that comes with this set is put in your back pocket that can work well to bring it in and out of the game. 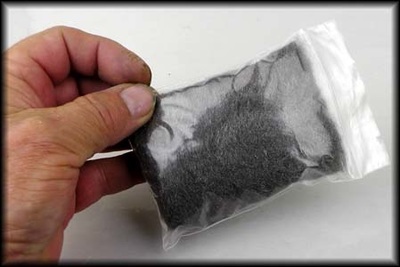 The magnet is so strong that your hand only needs to be in the area of the steel wool in your pocket to release your grip on it and the magnet with the item attached will move on it own to attach to the pocket. 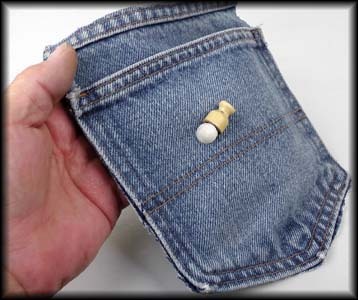 The M-snatcher can also work well in taking hard items, by rolling up a small ball of steel wool and placing it on the tip of the magnet. This works as a sound damper when working maybe with coins and other items. 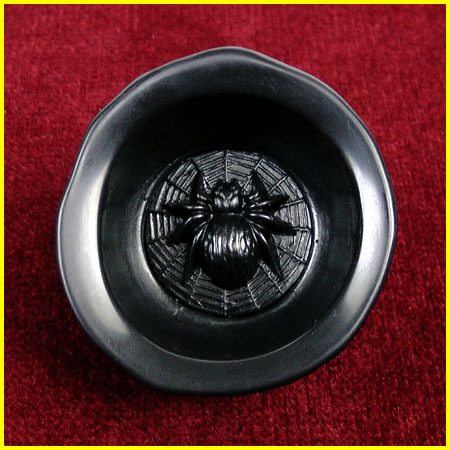 Spider Shell Trap: the shell trap is a clear plastic shell cover that traps the shell and ball inside it. The trap is made to have a perfect fit to the shell. It would seem impossible for the ball to escape with it being over a shell that the ball stays in the shell when moved. This can even be examined to see there is no escape for the ball when everything is moved. There is a secret way the ball can escape in an undetected way. The trap brings more hands-on fun for the player and is very visual. Light- weight and will not break like a shot glass. Also included are three little plastic spiders, dozen -Zots Singles Clear Adhesive Dots Small 3 16"X1 64" Thick to stick the spider on the back of the spectators hand for a startling surprise. One Spider Holder. Weight is 23 grams per shell This is a high-quality professional shell set! This shell set does not have the bottom ridge. The softball comes out of the shell when the shell is moved like standard type shells on the market. 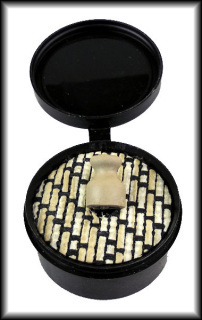 The shells do have the feature that can also bring the same fair shell features as the bottom ridge type shell when the shells are used with a natural cork ball. This set can also bring many different type startling surprises with the right accessories like with the above Spider Shells Accessory Package. 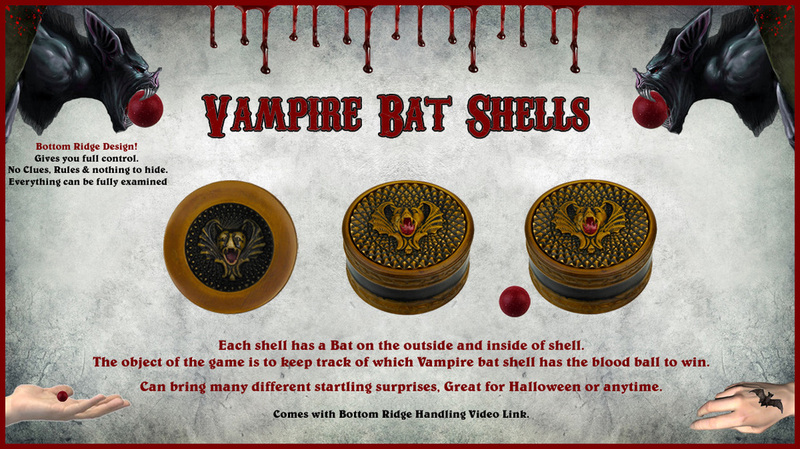 The Vampire Bat Shells are also one of the most advanced shells in the history of the three shell game and done without any gimmicks. 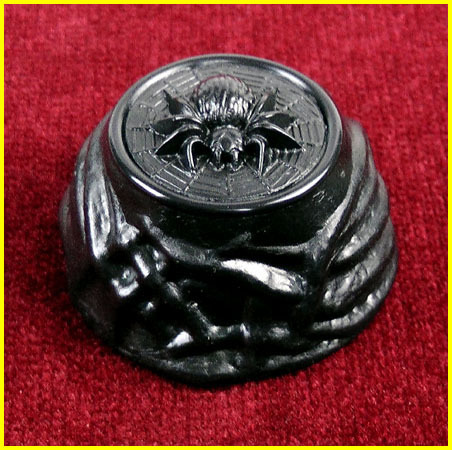 These shells are just like the Spider Shells, but with the Vampire Bat theme. The Metal Blended Blood Balls; the Blood Ball is a soft 3/8" ball with very fine metal blended all the way through the rubber ball. The M-Snatcher can be used for hands-on startling effects, like where the blood ball is placed on the spectator's hand and a shell is placed over the blood ball. The M-Snatcher will steal the ball as the shell is placed onto the hand. The other two shells are shown empty. When the spectator lifts the shell up off their hand, the blood ball is gone. When the spectator turns their hand back over to pick-up another shell, they will be startled by finding a little Vampire feeding on the back of their hand. This ending surprise is much like "Jim Pace's -" The Web". Just done differently. 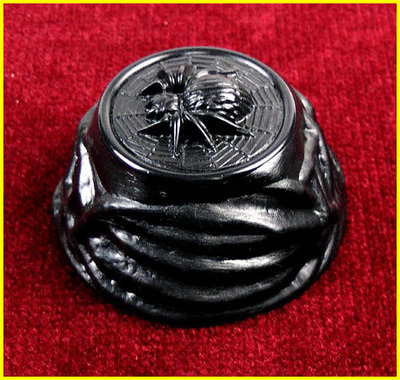 The Dead Man Shells are newly made molds that bring some new improvements over the original Dead Man shells. The back of the skull was brought up and the front of the shell was taken down some. This brings a better view of the skull, better balance and are easier to handle. The color finish is also more of a natural old bone finish. They are large type shells that show and handle well. The skull is 3" long and 1-3/16" at the highest point of the skull. The gripping on this shell is very good where there are inward natural notches behind the eye sockets for the thumb and index finger to have a good controlling grip on the shell. See above pictures. These large type shells can even be handled with all three shells shuffled around in one hand. The set comes with four balls that look like eyeballs. The object of the game is to keep track on which dead man has an eye. The shells were designed to be played as a game and not the same old shell game demonstration. This is for more hands-on fun. The eye sockets are open all the way through to the inside shell of the skull. This brings some cool features; the player can drop the eye into the skull shell of their choice and then see the eye inside. Once the shell is moved the eye will go out of view but can be brought back into view if you want to show it. The eye sockets being open all the way through like a real skull can also work to your advantage, where a ball can also be secretly loaded from the top or from the bottom of the shell. The player can even have hands- on fun when turning over the skull of their pick by pressing down on the tip of the chin and the skull will flip over to see if the eye is there. The shape and weight of the shells bring a very good balance to them for doing fancy flip overs. The player will even be able to do them. After they have flipped them over, you then can flip them back up with the index finger pressing on the back bottom of the shell and now ready to play again. Everything can be very visual, hands-on, without all the unnecessary no-touch gambling rules that must be applied with other type shells. The best part of the game; is there are no clues, rules or anything you need to hide. Everything can be fully examined at any time without switching anything out. This is because they are fair shells and can be shown to be fair. This is what makes the Con of the game, believing they do have a chance at winning. But at any time you choose, you can make it an unfair game, for the win. The shells have the 21st-century bottom ridge shell design that are the only shells ever make that can bring these features; where you have full control and are never forced to take the ball till you want it. This type shell will even fool the ones that know how the shell game is done. This is because they are not a predictable shell like the standard type shells on the market. "KEEP YOUR EYE ON THE DEAD MAN'S EYE TO WIN!" These shells look just like the Dead Man shells but do not have the bottom ridge design. These are like the standard type shell design where the softball will come out of the shell when the shell is moved. They are large type shells that show and handle well. The skull is 3" long and 1-3/16" at the highest point of the skull. The gripping on this shell is very good where there are inward natural notches behind the eye sockets for the thumb and index finger to have a good controlling grip on the shell. See above pictures. These large type shells can even be handled with all three shells shuffled around in one hand. The set comes with four balls that look like eyeballs. The eye sockets are open all the way through to the inside shell of the skull. This brings some cool features; the player can drop the eye into the skull shell of their choice and then see the eye inside. Once the shell is moved the eye will go out of view but can be brought back into view if you want to show it. The eye sockets being open all the way through like a real skull can also work to your advantage, where a ball can also be secretly loaded from the top or from the bottom of the shell. The player can even have hands- on fun when turning over the skull of their pick by pressing down on the tip of the chin and the skull will flip over to see if the eye is there. The shape and weight of the shells bring a very good balance to them for doing fancy flip overs. The player will even be able to do them. After they have flipped them over, you then can flip them back up with the index finger pressing on the back bottom of the shell and now ready to play again.